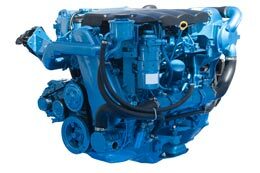 Below are a few maintenance tips to help you get the most out of your outboard engines and prolong their lives. After every trip, flush out the engine with fresh water. When flushing, make sure the ear muffs are snug and secure. Flush the engine for 10 minutes making sure you have good water flow from the propeller area and the engine has a good “pee” stream (outboards only). After running the engine, turn the key off and turn off the battery switch. You may also want to spray the engine down with a good anti-corrosion inhibitor such as Honda Corrosion Inhibitor. If your boat is an outboard and is in a slip, use the flushout port provided by the manufacturer, and if an outboard, tilt the outboard up out of the water. If it may take more than 30 days to consume the fuel in the fuel tank, we suggest adding a fuel stabilizer to the fuel each time you fill the tank. Portable fuel tank: Close the vent when not in use and store the fuel tank away from direct sunlight. 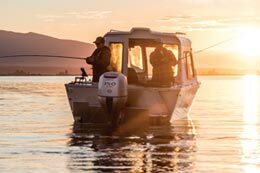 Inboard fuel tank: We recommend adding a fuel stabilizer following the manufacturer’s instruction each time you fill your boat’s fuel tanks. When you’re finished using your outboard, fill the fuel tank to minimize air in the tank. 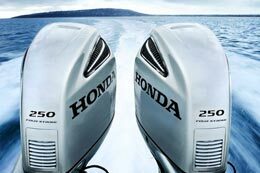 If you do not intend to use your outboard for 30 days or more, add fuel stabilizer when you fill the fuel tank. Start the engine (in water) and allow it to run until the stabilizer/fuel mixture fills the vapor separator or carburetors (about 10 minutes). Turn the engine OFF and disconnect the fuel line (portable fuel tanks). Note: If you normally use a fuel stabilizer when filling your fuel tank, stabilized fuel will already be in the vapor separator. 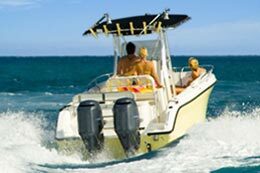 We recommend installing a primary fuel/water separator in your boat when the boat has inboard fuel tank(s). This filter is located between the fuel tank(s) and the motor. A primary fuel/water separator provides additional capacity to remove water and contaminants before reaching the motor’s filter.